The D’Aguilar Art Foundation is pleased to present ‘The Likeness of Being’, an exhibition featuring the portraiture of five Bahamian artists: Keith Thompson, Kachelle Knowles, Gio Swaby, Spurgeonique Morley, and Allan Wallace. Each of their works explore the themes of preserving the body – specifically the black body – as it navigates the natural and social environments around them. 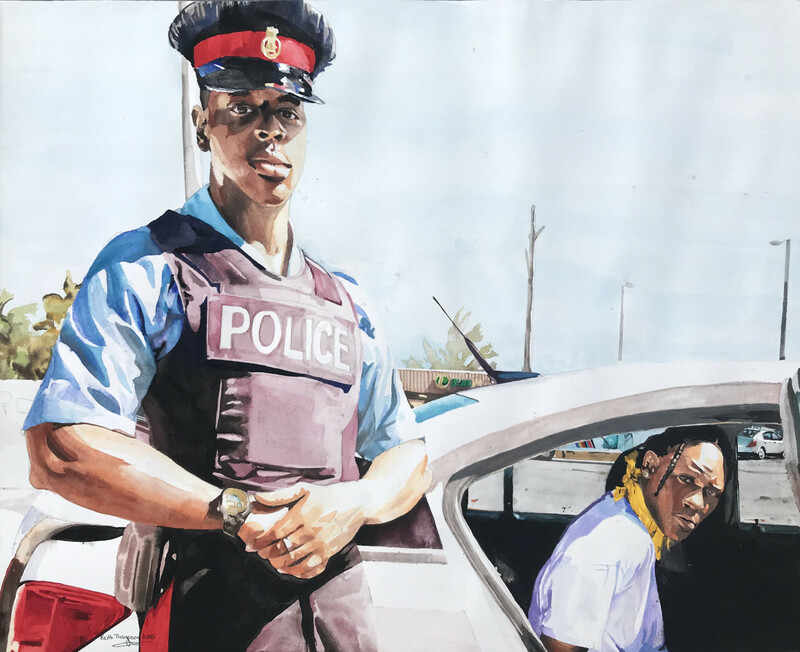 These deeply personal works all explore the artists’ individual experiences - whether it be in the Bahamian environment as a black man from a particular part of Nassau, or the Canadian environment as a black Bahamian woman – and celebrates the self in response to the people and places around them. Incorporating realism and folklore, these works present the artist’s different perspectives of self, and the unique and vibrant ways they view their individuality. 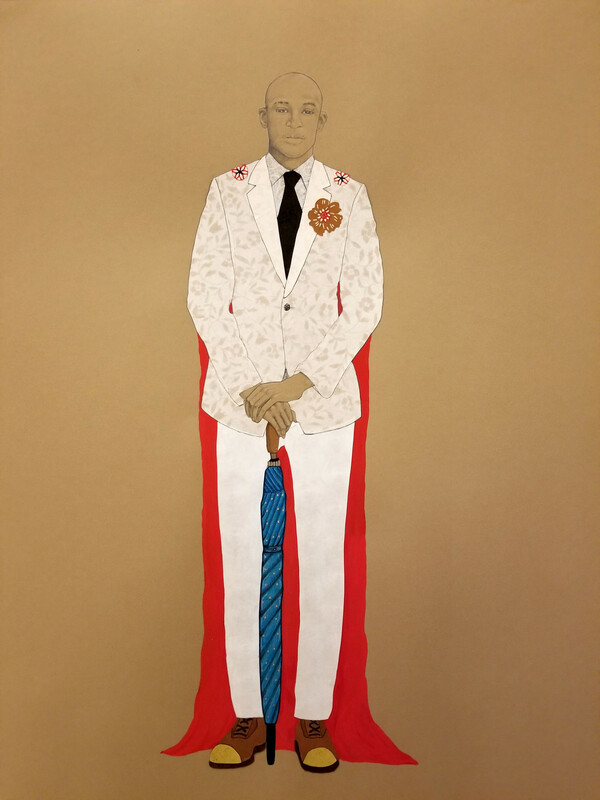 With Kachelle Knowles’ portraits, she celebrates the black male body: depicted in delicate pencil-marks, and adorned with meticulous colour and pattern, Knowles’s portraits dispel the archetype of the aggressive, sexualized black male, while inquiring into the complexity of identity and stereotype. Keith Thompson’s series of portraits are inspired by his own experiences growing up around crime and gang culture. Entitled “Fear”, these photo-realistic self-portraits as a man being detained by a Bahamian police officer exercises his own dread of easily falling into criminality. These portraits acknowledge that his image as a black male subjects him to these expectations -- and with delicate gouache strokes, his own vulnerability and humanness are pronounced, countering the harsh perspective in which society views him. Celebrating the sewing tradition passed down through her matriarchal lineage, Gio Swaby’s self-portraits are sewn, not drawn. She collages fabric, canvas and thread to create silhouettes of her clothed and unclothed body, distinguishable only by her signature afro hairstyle. These works are a homage to the quietness of a woman’s routine: the delicacy of self-care, the sewing of clothes, and the artistry of creating love for oneself in a foreign space. As a Bahamian living in Western Canada, Swaby’s work grapples with experiencing her blackness in a landscape that perceives her as “the other”. Allan Wallace will create a mural that incorporates the hanging vines on the south facing wall outside of the gallery. His three portraits will suggest that the vines are towering afros. Working in an instinctive and easy manner, Wallace creates beautiful portraits from his imagination. 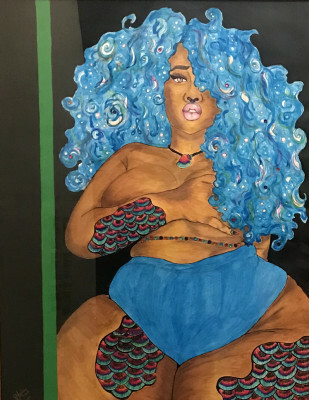 Spurgeonique Morley is exhibiting six paintings of a black female in lingerie inspired by a connection she made through instagram. Mimicking the instagram-selfie in which the subject can be unapologetically sensual and vulnerable, Morley creates work that explores the sexual and egotistical side of the female self. With Mermaid scales bedazzling the skin and curly blue hair, Morley’s subject becomes a creature of folklore. She pairs inspirational quotes with these aspirational portraits , a technique originating from advertising. Is she advertising herself, or is she telling her own story? Perhaps it is a combination of the two. 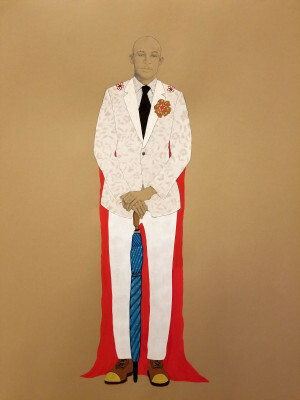 Kachelle Knowles is a contemporary artist who explores the ideas of gender identity, cultural preservation/ production, and social relations within the black community. She received her bachelor’s degree in illustration at Emily Carr University of Art and Design in Vancouver, Canada. She is currently working as a practicing artist in Nassau, The Bahamas. Keith Thompson is currently pursuing his AA in fine art at the University of The Bahamas. It was there where he started his profession as a full-time artist in the genres of painting, sculptor, digital art, illustration and ceramics. Through his opportunities at U.B, he has participated in numerous private and open call exhibitions. Thompson has made artwork for numerous businesses, homes, and churches. 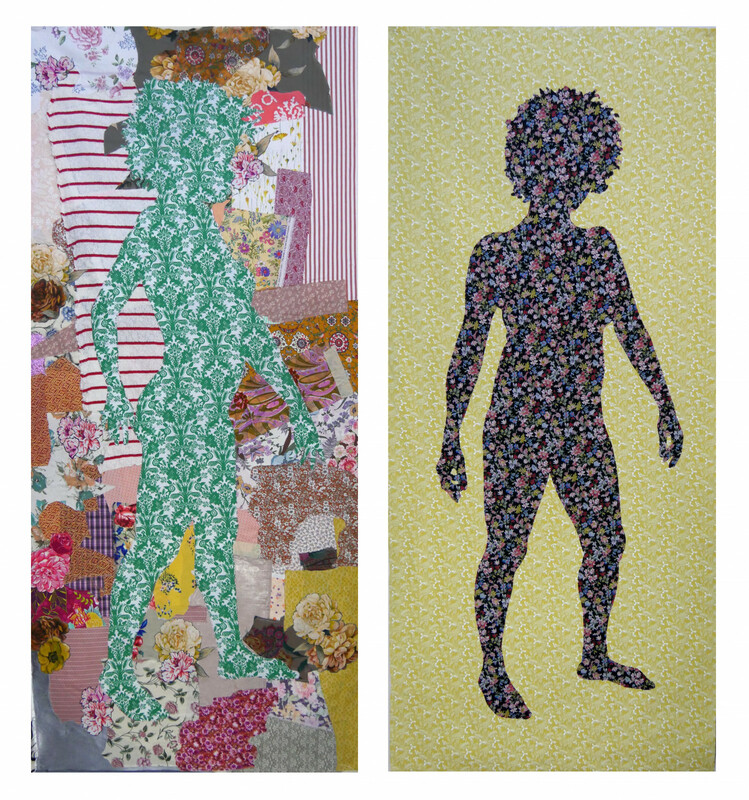 Gio Swaby is a mixed media artist whose practice encompasses installation, textiles, collage, performance, and video. Swaby was born and raised in Nassau, The Bahamas where she obtained her Associate of Arts degree at The College of The Bahamas in 2012. In 2014, she moved to Vancouver, British Columbia to pursue a Bachelor of Fine Arts degree majoring in Film, Video and Integrated Media at Emily Carr University of Art and Design. Swaby completed the program in 2016 and is currently based in Vancouver. Allan Pachino Wallace is a visual artist who specializes in murals and live-paintings. Wallace studied at The College of The Bahamas under the tutelage of Antonius Roberts and excelled at life-drawing, finding his niche in portrait painting. Wallace creates intricate, sometimes surrealist scenes, portraits and nudes from memory. He currently lives and works as an artist in Nassau, The Bahamas. Spurgeonique Morley was born in Nassau, The Bahamas on the island of New Providence, and she has had a passion for art from a very young age. 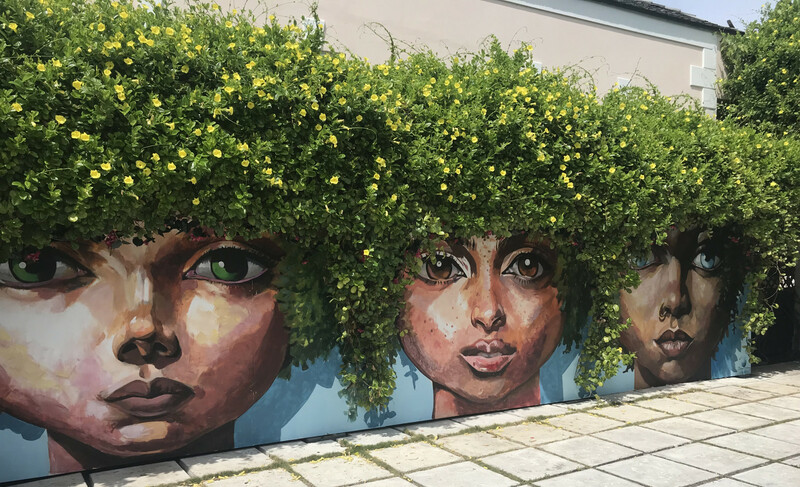 She graduated from The University of The Bahamas in 2017 with a Bachelor of Art Education, and she is currently an art teacher at C.H. Reeves Junior High school. Being a student and graduate from the University of The Bahamas has awarded her such great opportunities and exposure into the Art world; this is where her love of various mediums such as Ceramics and India Ink began. She has been apart of numerous exhibitions like, ‘Transforming Spaces’, ‘Issa Wybe’, Central Bank Exhibitions, and others. She is currently branching out into graphite, collage and mixed mediums.